Just a few more days to the end of the first school year of simply being a part-time teacher at Chrysalis. Been an interesting year. I aided Alysia with her 6th grade math class. For the first month, I worked a lot with a table of four boys (two of whom were new to Chrysalis) who were behind in math. They kept sabotaging each other. I’d be working with one of the boys, getting him to explain his thinking and leading him towards the answer when one of the other boys would make some inappropriate comment and the table would laugh and the momentum towards understanding would be lost. It was very frustrating for awhile. But the same pattern kept occurring over and over again with the same timing, irregardless of which boy I was working with. Then one time it happened again with the same timing and I suddenly saw it all with a different interpretation. They were rescuing one another. If you don’t understand math, math class can be horrible. The teacher asks a question that usually has a specific number as the answer. You can’t give a vague explanation like you might be able to in an English class. The answer is a single number and you have one in a hundred chance of guessing it. And until you say a number, you are on the hook. What I noticed was that the disruption would come when our discussion had come to a point where the boy needed to say a number. Questions before then about what was going on within this problem were OK but when it came time for a number as an answer, one of the other boys would create a distraction. Once I understood that, I grew intrigued by the dynamic rather than frustrated. It still took around two months to assure them that they weren’t being graded and that all we were interested in was helping them understand math. It was OK to give an answer because it would help us understand where they were in their thought process so we could adjust our teaching to where they were. We received twice our normal rainfall this El Nino year so I went out on lots of rainwalks, seeking opportunities to spread runoff over broader, more absorbent ground. When I make a diversion, my trowel creates two actions. First, I scoop sod out to make a diversion channel. Second, I lay this sod just downslope of the channel to form a berm paralleling it. This increases the functional depth of the channel. Each scoop achieves two things. Similarly, when I divert water, I increase the amount of water flowing off to the side to soak into more absorbent ground. But this move also decreases the amount flowing in the existing channel, thereby decreasing its erosive power exponentially. Every new action is two actions – there is doing the new action and there is not doing the old action. This is another reason not to underestimate our power. Our actions are twice as powerful as we tend to think of them. Which way is our Earth rotating? Last month, I had a chance to teach college students in an Environmental Sciences for Liberal Art Students course. Almost all of the students were planning on becoming teachers themselves. One of the opening activities I did was marking the shadow of a lamp post and then coming back ten minutes later and seeing that the shadow was now in a different position. I mentioned that we are taught somewhere in grade school that the explanation for this is that the Earth is turning but that most of us have put that in our brain as an explanation but never really connected it to our actual experience. So based on the two marks of the lamp post’s shadow, which way is our planet actually rotating? Most of the students started with their mental map of the world and tried fitting the shadow into it – instead of starting with the phenomenon. So there were lots of different opinions. I went with this diversity and encouraged discussion with different groups presenting their explanation and then sending them back to the phenomenon again. It took around twenty minutes for the group to come to agreement on which way we are rotating. We tend to teach the way we were taught, so teacher telling tends to lead to more teacher telling. There is nothing wrong with teacher telling. And there could be an institutional feeling that if I am being paid to educate these students, then I have an obligation to be giving them the answers to as many things as possible. But taking in, on authority, and memorizing well-organized material is a very different intellectual skill than creating understanding from raw experience. Both are valuable but the latter is important in a culture where all sorts of interest groups are packaging their ideas in well-organized forms that they hope will be easily taken in. I am still amazed at how naively unaware I went through sixteen years of education. Not until two weeks before college graduation did I realize I was totally clueless about what I was supposed to do with this education – and took me another year to start figuring it out. I played the Hand Game again with this year’s eighth graders. (See Cairns #29 and/or https://www.youtube.com/watch?v=JA4eXoc4I2o from playing it seven years ago). We had a really good discussion that deepened my understanding of the game. Quick recap: It’s played like Rock, Paper, Scissor except there are only two plays: open hand and fist. Both players look at the same chart to determine how many points they get. It takes awhile for them to understand how their partner, looking at the same chart, figures out their points. So I let them play for a while until they figure it out. They are free to talk during this time. Several of the kids come up to me excited that they have figured out how the points work and how they could always win. Once the students understand the point structure, I have them play ten times and total up their scores. Most of the groups come in with 10 and 10 because they both have figured out to always play Fist. I let them explain their thinking and they are always so delighted to explain how they figured out that if you always play Fist, you can never lose. That creates a shock wave and we discuss that. Why did you assume what you assumed? Kids are perceptive about this – but this year I keyed in on their claim that they had assumed that the goal was to get the most points. I told them that that was not true. Getting the most points was not the assumption they used and I would prove that to them later. The class was confused by that; they were sure that was the assumption they were working with. Then I told them that the way you win the Hand Game is to score the most points together. Then we play another round. Some of the groups play Always Fist and Always Open Hand and score 50 and 0. Some alternate their play and score 25 and 25. But most of them discover that the highest score is obtained by both playing Open Hand, 30 and 30. That’s when I was able to bring it around to pointing out that this solution led to three times as many points as when they were trying “to get the most points”. Why was this possibility invisible to them? It’s then they realized that their assumption had not been “getting the most points”. It had been “getting more points than the other person.” Or, more accurately, fear of the other person getting more points. The lesson concludes with pointing out that the 30/30 solution was always there within the chart but invisible to them when the 10/10 solution seemed the smart, delight-bringing choice. How many 30/30 opportunities exist around us that are invisible when we are working with assumptions that lead us to think of 10/10 as never losing? Reflecting afterwards, the game opened up to a deeper dimension. The 10/10 strategy seems logical when you can’t trust others. Once you start down that path, then you confirm to the other that you can’t be trusted and both of you come to trust that the other person can not be trusted. The thirty point path is only available for people who can trust that the other person can be trusted. The difference between when you trust that others will not be trustworthy and when you can trust others to be trustworthy made me realize that much of the culture of the “free market” (zero-sum games. caveat emptor. externalize costs and internalize profits) practices seeing others as not trustworthy. You see the world in a way that leads you to be untrustworthy to others, thus helping create this reality with one another. The karmic price is that you live within a world where all you can see are the 10/10 possibilities. All the 30/30 possibilities are invisible. However, my experience with Chrysalis is that it is possible to trust that the world is filled with 30/30 opportunities. Steven Covey in his Seven Habits of Highly Effective People sums this up as “Go for Win-Win or No Play.” He means that your intent in all interactions is to create a 30/30 working relationship where both parties benefit. If this can’t be worked out, if the only arrangement that seems possible is a zero-sum game where one party wins at the expense of the other losing, then you don’t play. The refusal to sink to a zero-sum game relationship is part of what makes the 30/30 possibility visible. For our spring vacation, I took Alysia to Big Bend National Park in southwest Texas where I first started working for the National Park Service forty years ago. The most unexpected change is that the Chisos Mountains now have 15-20 black bears. Bears weren’t there when I was there. They had all been killed during the ranching era. But a few found their way across the desert from the Mexican mountains in the 1990’s and now there is a breeding population within the park. We attended an evening program at the amphitheater where I had given my first evening programs as a young ranger. My first program had been on the geology of the park in which I told the geological history of the park in 40 minutes using slides. It was well-received and I was quite proud of it at the time but now I see it as falsely empowering the audience. They might think they now know the geology of the park but they only know it as words with very little application to world around them. I found myself now beginning to design an evening program that would use slides to teach people how to notice certain revealing details. The black streaks on the desert mountain faces, for example, indicate where water flows during a storm. Knowing this pattern helps your eyes start seeing the drainage patterns within the mountains. Lots of small, illustrated specific examples like that helping people start noticing more on their own as they drove within the park – and beyond. Give them the power to start seeing stories on their own. The Rio Grande forms almost two-thirds of the U.S.-Mexican border. What this means is that every tributary flowing in from the Mexican side (since that is the side Trump wants to build it on) has to flow through this wall. Or, put another way, the wall will have to cross every single Mexican drainage along more than 1200 miles of the river. We were counting drainage crossings as we drove along various stretches of Texas desert and estimated them at about three per mile. At that rate, there would be about 3500 drainage crossings. More than half of these would be small. A few would be full-size rivers. But a lot of them would look like the picture below. 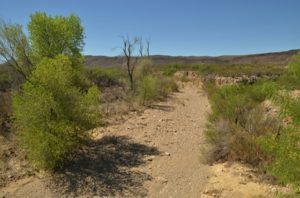 This fairly typical arroyo within the park flows towards the Rio Grande. The cutbanks on the right (along the outside bend where the water erodes the strongest) are about twelve feet tall. 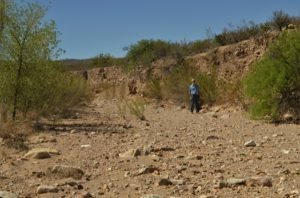 The main thing to note is that both the stream bottom and the stream banks are alluvium – unconsolidated stream deposits of sand, silt, gravel, and cobbles. Within the arroyo are found many plants including a dead cottonwood tree in the background. These arroyos form natural trails through the desert so the wall has to block them. How does it do this? This is desert and the arroyo is usually dry but if there is a thunderstorm up in its watershed, runoff will flow. It hopefully won’t be a dramatic flashflood but it will flow for several hours. The wall must stop anybody wanting to walk along the arroyo but it can’t stop water. If it tries to stop water, the wall becomes a dam. As the runoff backs up, the water pressure increases with depth and can buckle a dam. Dams handle this by being much broader at the base than most people realize – which makes a dam much more expensive than a wall. Also, because of this pressure, dams must be anchored in place to solid bedrock so that the water pressure won’t push them out of place. But that is not what we have here. Bedrock might be fifty feet beneath the arroyo. This alluvium is unconsolidated which means that if water backs up behind the wall, the water pressure will force the water through the alluvium, the silt and sand grains will start to flow and the water pressure will eventually blow a hole underneath the dam. To prevent this, one would need to excavate down to bedrock and build upwards from there. But if the alluvium is tens of feet thick, grounding the “wall” to bedrock becomes very expensive. 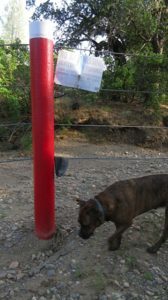 One runs into a similar issue with the banks of the arroyo on either side. You can’t simply abut the wall up against the arroyo bank. Water pressure will force the water through the alluvium around the edge of the wall and blow a hole on the side. Therefore, one would have to trench back into the bank a long way to anchor it in place. In other words, each arroyo crossing is an expensive proposition. The solution might seem obvious. Let the water pass through a culvert or overflow channel. But overflow channels have to slope to prevent the water from hitting the bottom of the dam so hard that it plucks out a plunge pool that undermines the dam and this slope can be climbed by people. 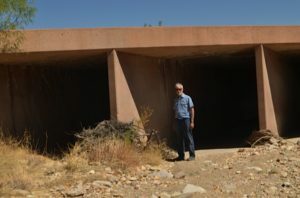 Similarly, culverts can be crawled through. Again, the solution might seem obvious, weld grates across the culverts or overflow channels with openings smaller than people can crawl. This is where we run into the other problem about building a wall across an arroyo. Water is not the only thing flowing. The runoff carries debris: leaves, dead bushes, broken branches, and, eventually, the trunks from those dead cottonwood trees. Each item stuck against the grate divides the openings into smaller-sized openings which allows smaller things to get stuck which divides the openings into even smaller size openings. The floating things pile up, pinned against the grate with increasing hydraulic force as the runoff backs up. Within a few hours, this wall with grated culverts turns into an under-designed dam and it fails. This picture conveys a sense of this. The bridge I stand below has channels twelve feet wide and ten feet high to let the debris safely pass and even still, debris is piled three feet high and six feet wide against one of its abutments. Imagine what would happen against grating that has just one-foot gaps. Culverts need to be maintained, often during the height of the storm when tree trunks are washing down and everything is backing up. If the wall is wide enough for a backhoe to drive onto, this work can be done during the storm. But a wall wide enough for a backhoe is expensive and there will be many hundreds of these arroyo crossings that will need to be patrolled. That creates a permanent maintenance cost that needs to be factored in. You can clear the debris out by hand and chainsaw after the flood subsides but if the flood overtops the wall, the wall might wash out before then. I once had a ride on a highway that the Mexican government had built, I’m sure with much fanfare, to connect the small villages south of Big Bend to the interior of Mexico. The highway had several concrete bridges crossing the arroyos. But the truck kept turning off the highway and dropping down into the arroyo and up the other side back onto the road. As I looked up, I saw that the bridges had not been anchored into the banks and erosion had worn the alluvium away from one or both ends of the bridge so that there was now a five or ten foot gap between the highway and one end of the bridge. The bridges had made the government look good for a year and had enriched some contractor but now they were just expensive landmarks to incompetence. 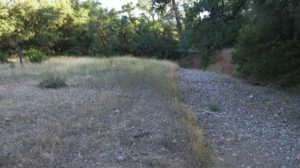 I wanted to end this article with a picture of a barbed wire fence that crosses a “dry” streambed in our neighborhood. It survives by having an easily crawled under three-foot gap beneath the lowest wire. However, when I walked there to take a picture, I found that it was down. You can see a fencepost standing on the left. You might see the strands of wire lying on the ground across the 10 foot wide streambed. On the right hand side of the streambed is a small log. It hooked onto the wires during high water and the force of the water against the log was sufficient to pull the fence down. Here is a stronger fence built by a long-time ranching family who has the experience and equipment to build a quality fence across a usually dry streambed. But understand the scale. This is not barbed wire; it is steel cable. The posts obviously are sunk deep. It will hopefully survive decades of flood surges. Its four layers of cable will stop cows but they won’t stop people. My dog is about two feet tall; my half-sock camera “bag” is draped over the cable. A person can easily crawl beneath the lowest cable.